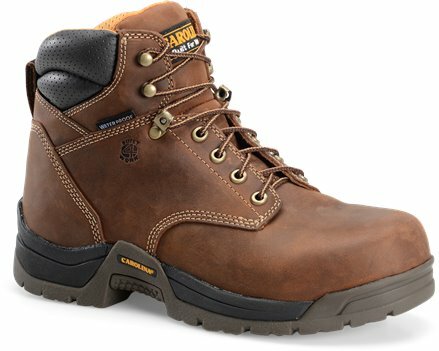 A classic looking work boot that is tough and waterproof. It’s incredibly reliable, making it the perfect choice to get some work done. 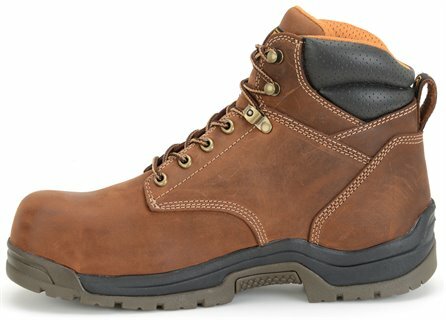 Also available in a composite safety toe style CA5520. Quality materials as well as craftsmanship from what I could tell. It fit really well in all places but the heel. Only thing bad about the shoe for me was that the shoe back does not sweep inward above the heel. Thus, my heel kept sliding up out of the shoe with every step. Very annoying..to ME. May not be an issue for others though.Thank you for the easy return policy Shoeline! Already have another style on its way back to me! These are fantastic boots! I'm on my third pair about to go into my 4th. I am on brushed concrete surfaces all day long which really wears on boots. I get over a year out of them which is twice what I have got with any other brand. And Shoeline always has them in stock. Mine is a 12 4E. Not a common size for sure. Great boots! I recommend these to everybody that works outside in all types of weather. Rugged and really last. The boot I ordered was delivered in a brushed leather, not the smooth 'water proof' shown in the picture. By the time I had realized this I had worn the boot and don't think I can change them out. The boot is very comfortable, this is the second pair I have owned. This is the second time that I have purchased these boots and I am just as satisfied as the first. I will not ever shop elsewhere for dependable waterproof boots.Shoeline and Carolina Boots are who you need to go through if you are looking for quality and dependable products. I sent these boots to my son who works construction in Indiana. he hasn't been able to find any in his width. so he was buying them long to be able to fit his fat feet. he called complaining and I sent him these. they fit perfectly and he's a happy boy! glad to be of service, son. i'll be needing another pair soon. I want to give these boots a awesome review. I have been searching for a long time for them. This is the first time I have tried Carolina boots. Finding a extra wide width is extremely difficult. I would definitely purchase these again! My only wish is that they come in 8 height. Thank you Carolina for a great product! After six months of use, still very happy with fit and comfort in a variety of work situations. I find these work boots to be very comfortable, and true to size. I am constantly moving around at work, and they are cushioned as well, for comfort. One of the best work boots I have bought, for the money. My second pair and can't say enough about how comfortable they are to work in. The fit is right on target. After years of buying the same work boots that became an uncomfortable fit as I got older, I decided to try these boots on a friend's advice. Am I happy I did. Nice wide toe space and wider widths to choose from. Comfortable after walking many miles and working in all kinds of wet/dirty conditions. VERY pleased! I've already ordered another pair. I work on my feet all day 12 hours a day these Carolina boots are as comfy as my gym shoes. I live in Idaho and work on road projects which requires a lot of walking on hot asphalt and through other obstacles throughout the year. I bought a pair of these boots well over 2 years ago and have put tons of miles on them. They have held up strong until this spring where they were finally starting to crack and the sole started to separate. I have been more than pleased with their performance and am now in the process of ordering another pair. Very good product at an outstanding price! Very nice looking boot, came in a wide size for my husband's wide feet! So nice he wants to "keep them for good," and get another pair for work! Fit well and good price, especially with the discount. I found these boots are narrower than sized. I have other carolina boots in 2E and they fit fine. I have a time finding work boots that fit. I ordered a size larger than needed based on other reviews. Great boot, great fit, great service. I will order another pair very soon! I have wide feet. 4E Wide. And while looking for a good pair of boots I came across these. What caught my attention was the wide box area. I ordered a pair - took about a week to get them to California , and have been wearing them for a week now. I bought a half a size larger as some reviews said they run small. Almost wish I would have gone a full size, but they fit pretty good like this. The width is very good. Comfort was very good from the first day. The inserts not so great to e, but I changed them out with my Dr. Scholls right away. I wanted to try their comfort ones, but they were not listed as available for this. All in all - seems like a good buy so far. Time will tell. Second pair I purchased. Very rugged. Light weight for the durability and support. Older pair nine months old and still in good shape. Will buy another pair next year. I am a big guy. I am standing on my feet for about 8-10hours a day. My feet feel great even after a long day. I see my coworker work boots and shoe they are wear are not working for them. Buying a cheap workboots not the best idea for them. I am still going strong. Will buy more soon Thank you. This by far is the BEST boot I have EVER purchased. They are crazy comfortable. I have gone years with width problems and foot pain at the end of the work day. That has completely been resolved. Well built, good looking, and VERY comfortable. This is a must buy - and I hate doing reviews. I was disappointed in the boot Thought it was made in USA NOT CHINA. Great fit. Because of having a very wide foot it’’s sometimes hard to find a boot in my size. This fit perfect and very confortable. Finally A 4E shoe that is truly wide enough in the toe box to accomodate my husband’’s bunion We’’ll be ordering more It’’s even attractive to "boot" pun intended. I wish I had discovered Carolina Boots years ago. I’’m 6’’5" 350lb. wear size 16 EEE. I wear out shoes fast. Not to mention the trouble I have finding shoes to fit. These are very comfortable. You have a new customer. nice work shoe.took about three days to break them in. I have been searching for the perfect boot and now I have. Although it’’s made in China this Carolina Boot has been engineered perfectly. I work on the highway systems all day in California and that means foot fatigue. Not anymore. Thank you Carolina team. I love these boots. They are a great value. Comfortable doesn’’t begin to.describe them. Feel as though I have deprived myself for years by not purchasing them before now.